Puppetry is not just for children. In the hands of the Masters of this ancient story-telling art, its magic can delight, inform and move us in extraordinary ways, and the Papermoon puppeteers are such Masters. Bravely tackling the hideous story of the coup that occurred in Indonesia in 1965-66, this company took us sweetly into the lives of adorable 4-year-old Tupu and his 9-year-old brother and champion, Moyo, loving and joyful boys living with their father, Baba, in their simple village. We are quickly captivated by this little family and their neighbours, and drawn into their delightful relationships and daily lives, their innocence a stark contrast to the looming, ugly-faced and ever growing military forces. We fear for their safety as the struggle for survival creeps insidiously into the minds and lives of decent people, changing them forever. Through mixed media, mask and the glorious puppetry of this troupe, Papermoon Puppet Theatre skilfully shows us that good story-telling is not complicated and that any story, no matter how horrendous its outcome, is best served by being told, witnessed and felt. Underscored by an excellent soundscape that interacts with and informs the action and enriches every scene, this piece is truly international, as it doesn’t rely on text or language but uses the power of sound and visual image to touch our hearts. The performers use their particular genre to carry their message to the audience and trust in the magic of theatre to support their story. The stark and simplistic images speak for themselves, and the animation of the puppets gives us a hair’s breadth of removal from the impact of what we are seeing, so that we are not totally broken by its reality. Mwathirika is a deeply moving, beautiful and important piece of work. It opens this tragic story of the Indonesian people to the rest of the world, those of us who were shamefully unaware of what had happened, and informs us in an understated, non-judgemental and respectful way. The events portrayed touch us at our core and are wrong in any language. 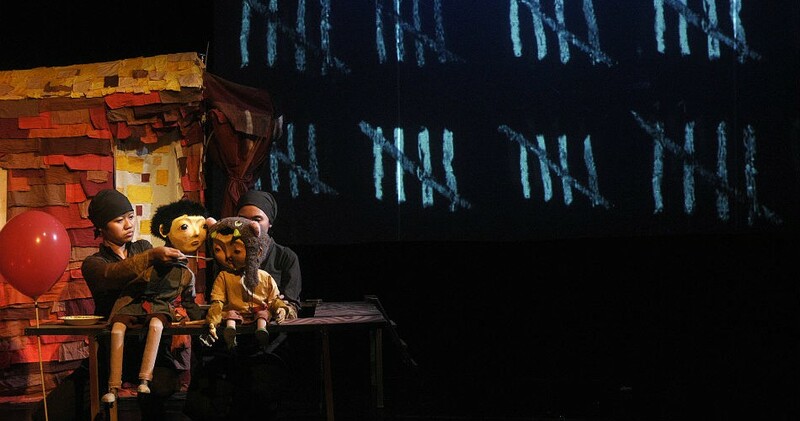 Mwathirika continues at Rehearsal Room via Dunstan Playhouse Foyer, Adelaide Festival Centre, from 6.30pm until Sat 26 Sep.
[INDONESIA] Rehearsal Room, Adelaide Festival Centre, Fri 25 Sep Puppetry is not just for children. In the hands of the Masters of this ancient story-telling art, its magic can delight, inform and move us in extraordinary ways, and the Papermoon puppeteers are such Masters. Bravely tackling the hideous story of the coup that occurred in Indonesia in 1965-66, this company took us sweetly into the lives of adorable 4-year-old Tupu and his 9-year-old brother and champion, Moyo, loving and joyful boys living with their father, Baba, in their simple village. We are quickly captivated by this little family and their neighbours, and drawn into their delightful relationships and daily lives, their innocence a stark contrast to the looming, ugly-faced and ever growing military forces. We fear for their safety as the struggle for survival creeps insidiously into the minds and lives of decent people, changing them forever. Through mixed media, mask and the glorious puppetry of this troupe, Papermoon Puppet Theatre skilfully shows us that good story-telling is not complicated and that any story, no matter how horrendous its outcome, is best served by being told, witnessed and felt. Underscored by an excellent soundscape that interacts with and informs the action and enriches every scene, this piece is truly international, as it doesn’t rely on text or language but uses the power of sound and visual image to touch our hearts. The performers use their particular genre to carry their message to the audience and trust in the magic of theatre to support their story. The stark and simplistic images speak for themselves, and the animation of the puppets gives us a hair’s breadth of removal from the impact of what we are seeing, so that we are not totally broken by its reality. Mwathirika is a deeply moving, beautiful and important piece of work. It opens this tragic story of the Indonesian people to the rest of the world, those of us who were shamefully unaware of what had happened, and informs us in an understated, non-judgemental and respectful way. The events portrayed touch us at our core and are wrong in any language. Nikki Fort Mwathirika continues at Rehearsal Room via Dunstan Playhouse Foyer, Adelaide Festival Centre, from 6.30pm until Sat 26 Sep. Book at BASS on 131 246 and bass.net.au. Click HERE to purchase your tickets.